*Addiction (Noun 1. Being abnormally dependent on something that is psychologically or physically habit-forming (especially alcohol or narcotic drugs). 2. An abnormally strong craving). Ok, lets start with the word asset. Michael McCook is to VMX as air is to humans. Mike has put together this awesome online VMX magazine for all of us VMXer's. I, being a friend of Mike's and wanting to do my part have agreed to contribute to as many issues as possible. I decided to pass along as many secrets and tips as possible when dealing with old dirt bikes. With this issue you should be reading about my first attempt at wheel building and what I learned, both right and wrong. Hmmm, no such luck. 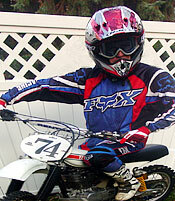 I have been addicted to VMX since 1997. I was first introduced back in 1991 and it took six years for me to catch on. What a fool I was. But, of course, for all the good there is in the VMX world, there is the dark side. A side well hidden and so dark they we will rarely share it with the wife for fear that she will try to cure us of this horrible, dark, dark thing. What is this darkness I speak of? Vintage dirt bike addiction, VDBA. Notice this affliction starts with the letters "VD". I never got around to building a wheel, any wheel. Not even a wheelbarrow wheel. I did put air in my wheelbarrow wheel though, if that counts. I was caught up in VDBA. I have become consumed with multiple projects, collecting parts for those projects, tripping over these projects, buying new projects before completing previous projects, getting involved in others projects, helping others buy projects, trading old projects for new projects, and renting storage space for more projects. WHEW! Do you remember the Sunday cartoons when the character would open a closet door and the world would come crashing down on them, well, that is my garage. Build a wheel... not in the epicenter of hell. My wonderful hell, but hell never the less. I have arrived at a point of total overload. How so. I have collected most of the parts for most of the projects all at the same time. How bad can this be? Let me list the projects that my 17x17 shop has to handle. These are just the one's ready for final assembly. Not counting the finished race bikes or modern bikes or projects still waiting for me to collect parts. OK, to some, I am a total lightweight. I have not even a tenth of what a lot of racers/collectors have. Yet, I have been collecting parts for all these bikes for quite some time. It seems that I have collected all the final parts at nearly the same time. My head swims when I walk in to the garage. Where do I turn, what do I feel like working on? What do I have room for? How many projects should I have going on at the same time? DO NOT TELL MY WIFE. This leads to other issues. I missed a VMX race or two (OK, two but I hate to admit it) due to this overwhelming load of projects since I have neglected regular maintenance of my race bikes leaving me no time to prepare for a weekends VMX event. Sad, very sad. By nature I am a very clean and organized person, besides this enduring saga. But, I got a plan. Finish one bike at a time and move on through to the next. Ha Ha Ha Ha Ha Ha Ha Ha Ha Ha. So, in the next issue, look for that Wheel building story. I am hoping to have an engine-painting article soon after that. Of course you could be reading about VDBA again real soon.